Washington - U.S. Democratic presidential candidate Bernie Sanders defeated Hillary Clinton in the West Virginia primary on Tuesday, slowing her march toward the party’s nomination. Despite the setback, Clinton is still heavily favored to become the Democratic candidate in the Nov. 8 election. But Tuesday’s loss could signal trouble for Clinton with working-class voters in the U.S. Rust Belt, where she will need to prevail in key states such as Ohio and Pennsylvania when she takes on Trump in the general election. Clinton in March said the country would “put a lot of coal miners and coal companies out of business” at an Ohio town hall in a comment that appeared to hurt her with voters in coal-mining states such as West Virginia. During Clinton’s visit to West Virginia and Ohio last week she repeatedly apologized to displaced coal and steel workers for her comment, which she said had been taken out of context, and discussed her plan to help retrain coal workers for clean energy jobs. Trump, 69, won West Virginia handily on Tuesday, after his two remaining rivals, Ted Cruz and John Kasich, dropped out of the Republican race. Trump has zeroed in on Clinton’s protracted battle with Sanders, a 74-year-old U.S. senator from Vermont who pulled off a victory in Indiana’s Democratic primary last week despite trailing in opinion polls. Trump has taunted Clinton in recent days by saying she “can’t close the deal” by beating Sanders, her only rival for the Democratic Party’s nomination since Feb. 1. Clinton, 68, has said she will ignore Trump’s personal insults, including his repeated use of his new nickname for her, “Crooked Hillary,” and instead will criticize his policy pronouncements. To secure the Democratic nomination, a candidate needs 2,383 delegates. Going into West Virginia, Clinton, a former U.S. secretary of state, had 2,228 delegates, including 523 so-called superdelegates, elite party members who are free to support any candidate. Sanders had 1,454 delegates, including 39 superdelegates. Another 29 delegates will be apportioned based on West Virginia’s results. Clinton and Sanders will compete in another primary contest on May 17. 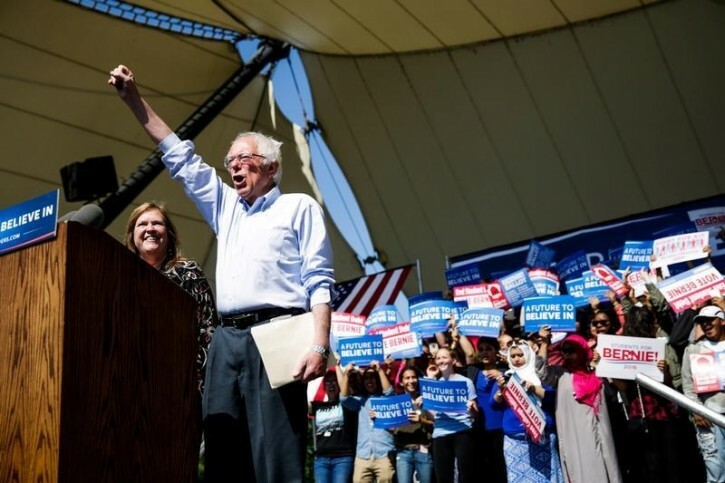 Both candidates are also looking ahead to June 7 contests in which nearly 700 delegates are at stake, including 475 in California, where Sanders is now focusing his efforts. Sanders has vowed to take his campaign all the way to the Democrats’ July 25-28 convention in Philadelphia, and wants a say in shaping the party’s platform. Sanders has repeatedly told supporters at packed rallies that most opinion polls indicate he would beat Trump in a general election match-up by a larger margin than polls show Clinton defeating Trump. “Washington - No. 1 office supply chain Staples and smaller rival Office Depot Inc said they terminated their planned merger on Tuesday, after a U.S. federal judge...” Washington - Staples, Office Depot Scrap Merger Deal After Judge Rules For FTC	“New York - There's no trademark on America. Budweiser, now owned by Belgium's AB Inbev, will rename its beer "America" this summer and alter its labels with images...” New York - Budweiser Becomes "America." Drink Up. Or Not.